A metropolitan county located in the Yorkshire and the Humber region of Great Britain, West Yorkshire is the largest urban area located within the historic borders of Yorkshire county. The region consists of five urban boroughs- City of Leeds, Kirklees, Calderdale, City of Bradford and City of Wakefield. The county lies on rocks of the Carboniferous age. To the West of the landlocked county of West Yorkshire lies the Southern Pennine fringes and to the east lies the Yorkshire Coalfield. Although the landscape of the region is dominated by dense road and rail networks alongside factory silhouettes and urban settlements, the sloping Pennines, flowing rivers and steep-sided valleys characteristic to the region creates a stunning natural backdrop to the urban extravaganza. Today, across the county one might encounter derelict buildings and abandoned compounds that had once been integral to West Yorkshire’s industrial activity. The smooth undulating land interspaced by dry valleys to the east of Wakefield and Leeds is known for its parklands, plantation estates and woodlands. West Yorkshire is drained by rivers like Calder and Aire. The county experiences an Oceanic climate and the winters can get quite chilly. Rivers Wharfe and Aire have also been reported to have frozen over in particular years. Since West Yorkshire is located inland and enjoys high altitudes, temperatures tend to fall below that of counties located further south. The economy of the region is quite robust as well, since it enjoys the privilege of well-structured infrastructure that woo investors. Traditionally, industrial activity in West Yorkshire relied on woollen mills, textiles and coal mining. Today, the manufacturing, services-oriented as well as small-scale industries are going strong in the area. Distribution and retail-based chains are doing quite well too. Leeds has evolved as a major seat of economic activity and attracts financial investment from around the world. West Yorkshire is a study in diversity, with its calm Pennine villages and hiking trails calling out to nature enthusiasts as much as its industrial heritage towns calls out to history buffs. One can even head over to the countryside at Haworth to enjoy first-hand the hills and dales that came alive in the novels of the Bronte sisters. 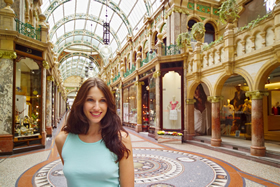 Leeds offers a number of upscale shopping centres, museums and galleries for a taste of English sophistication. 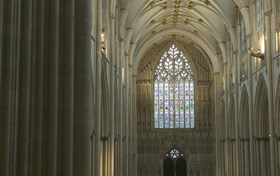 The Yorkshire Sculpture Park, the Kirkstall Abbey that gives you a taste of 12th century England, the Hardcastle Crags which offer a journey inside a 19th century mill and Fitzwilliam Country Park are other notable attractions. A scenic county with a rich historic legacy, West Yorkshire is welcoming with its vibrant cities, active communities and rejuvenating escapades. Here you can get the taste of both an urban England as well as that of the Victorian country. 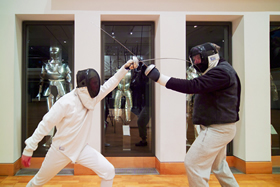 Fencers engaged in combat at the Royal Armouries in Leeds, Leeds, West Yorkshire. 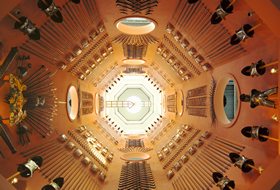 Looking up at the impressive display of nearly 3000 historic weapons in the Hall of Steel which towers 100 feet over visitors to the Royal Armouries in Leeds. North of England - York Minster cathedral interior, York. 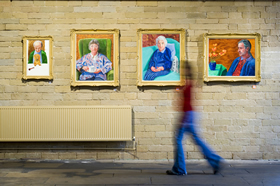 Woman passing portraits of Ken Wathey with Sophie, Margaret Hockney, Laura Hockney and Jonathan Silver (1996) on display at the Salts Mill gallery in Saltaire. Woman standing in one of the two arcades that form a part of the Victoria Quarter in Leeds.